Wash black gram and raw rice in a bowl and add water to soak them. Soak the dal and rice for 6 hours or overnight. Drain water and grind the dal and rice along with salt using this drained soaked water using a mixer grinder or wet grinder. Grind the dal and rice to a smooth textured batter. Batter should not be too thick or too thin as it has to coat the stuffing balls. Transfer batter to a bowl and let it ferment for 6 hours. Check the batter in between say after four hours, if a spongy fermented texture starts appearing, the batter is ready to make poornam boorelu. In hot climate batter ferments fast and in cold weather it takes time to ferment. So by observing, one can easily make out when the batter would be ready. Add bengal gram into a bowl and wash well. Add water (100gms-1/2cup) to the bengal gram and place the bowl in pressure cooker and cook on high flame. After first whistle, cook the bengal gram on low flame for 10 minutes. Allow the pressure cooker to cool completely and then remove the cooked dal bowl from it. Place a strainer in a bowl and add the cooked dal into the strainer and allow it to cool. Observe that the bengal gram appears to be JUST cooked---press a cooked dal grain between fingers and observe that it is soft but not mushy. Once cool, grind the cooked bengal gram to a powder in a mixer grinder. Using a mortar and pestle or a spice grinder, make powder of cardamom seeds and 1tsp sugar and cover the powder till used to retain the fragrance. Take a bowl and add grated jaggery and water (100gms-1/2cup) and heat it. Stir the jaggery mixture till it dissolves completely in the water. Strain the jaggery mixture through a fine mesh to remove any impurities. Heat the jaggery mixture on high flame stirring occasionally till the mixture is thick and foamy. Reduce flame to medium and cook stirring till syrup reaches 122oC on candy thermometer (that is between hard ball stage and soft ball stage). Check the consistency of the syrup by dropping a portion in water and observe---the syrup should form a ball and if the ball is thrown from a distance into a plate it should make sound indicating that it is slightly hard. Switch off the flame and add the cardamom powder and mix. Then add the grated coconut and cooked dal powder and mix well to form soft dough. Spread the dal mixture into a plate and cool. 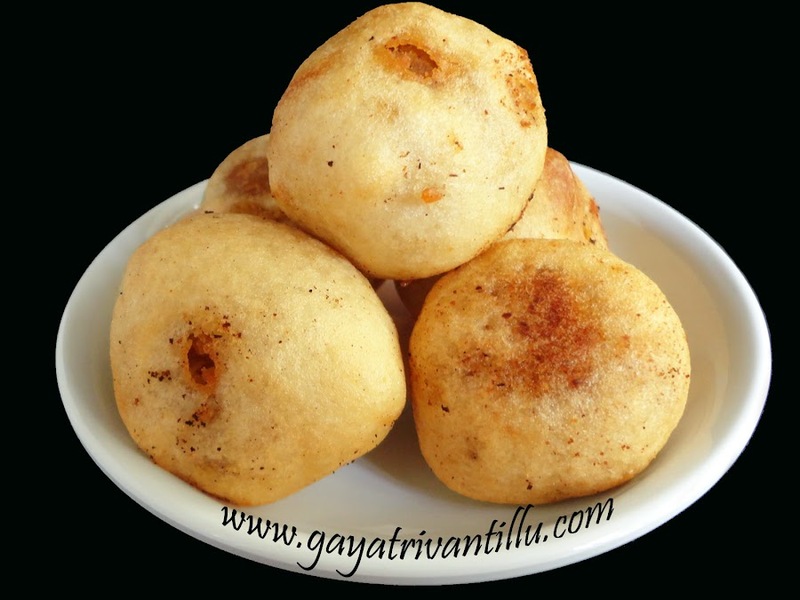 Make balls of the dal mixture (poornam) to make poornam boorelu. Spread a paper napkin in a plate and keep it nearby so that after frying the boorelu, one can place them on paper napkin to soak excess oil. Heat a pan and add oil to it. Heat the oil on medium heat. Take a dal dumpling (poornam) and dip it in the batter and carefully drop it in oil. Similarly add sufficient dumplings to the oil taken. After frying for few seconds, turn the boorelu in oil carefully with a slotted ladle. Fry stirring till the boorelu turn golden in color. Take the fried boorelu from oil using a slotted ladle and place them on the paper napkin to soak excess oil. 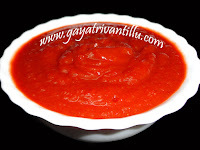 Make another batch in the similar way and fry all boorelu. Poornam is the stuffing and boorelu is the fried dumplings---and poornam boorelu means stuffed fried dumplings. This is a traditional sweet made in Andhra Pradesh in all functions. 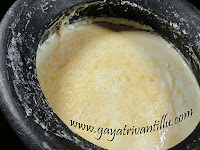 Fermenting the batter to the right texture is very important in making poornam boorelu. If the batter is fermented fully, the boorelu would absorb more oil. If batter is not fermented or less fermented, the covering would taste slightly hard. Adding sufficient water to the batter is also very important in fermenting the batter properly. If using a mixer grinder over wet grinder, fermentation process takes a bit longer time. Check the batter after four hours after keeping it aside for fermenting. If the batter starts changing to a spongy fermented texture, then it is ready to make poornam boorelu. In hot climate batter ferments fast and in cold weather it takes time to ferment. So by observing, one can easily make out when the batter would be ready. Experience brings perfection. Adding a pinch of salt to the batter enhances the taste of poornam boorelu. If jaggery is not available use sugar instead---however jaggery ones taste better. Adding grated coconut gives some crunch and a nice taste. If one is regularly making sweets at home and requires cardamom powder, then take sufficient quantity of cardamoms and sugar in a mixie jar and grind to a fine powder. Store this cardamom powder in airtight bottles and use as and when required. After straining cooked bengal gram observe that only few drops of water would be drained through the strainer. It is always advisable to add mentioned amount of water to the jaggery and cook while making syrup. Many may get the doubt that when water is to be evaporated to make syrup then why to add that much water. Jaggery when cooked in water melts completely and tastes better. It is something similar to bajias when fried in hot oil on high flame gets color fast but will not be cooked properly from inside. Similarly jaggery needs to get cooked properly first and then thickened to make syrup. Do not make more poornam boorelu as they do not have much shelf life. As bengal gram and grated coconut are used in stuffing, these boorelu get spoiled soon. So make in small batches as needed and enjoy them fresh instead as leftovers.After making poornam boorelu, observe that only half the quantity of batter is used and half is still remaining. Sufficient batter is required to immerse and coat the filling balls. To the remaining batter add sufficient salt and keep it aside and fully ferment it and make dosas next day. Poornam boorelu is a great sweet treat enjoyed by all during festivals.